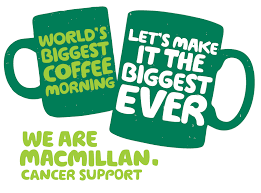 A Macmillan World’s Biggest Coffee Morning event is taking place in the Mile Cross Salvation Army’s hall, on Vera Road, Hellesdon, on Friday September 28, from 10am-noon with all proceeds going to the cancer charity. The morning will include tea, coffee and homemade cakes. Fellowship evenings kicked off on September 3 and will be held on every subsequent first Monday of the month, from 7.30pm-9pm. Each month there will be a different speaker, followed by tea or coffee. On October 1 Hellesdon parish councillor, Shelagh Gurney will talk about her role. Saturday November 10 will see an Old Tyme Music Hall afternoon, at 3pm. Artists from far and wide will be taking part including the choir from Mile Cross Primary School. Tickets cost £4 to include refreshments. This entry was posted in Hellesdon, Home Page and tagged Hellesdon, Macmillan Cancer Support, Salvation Army on September 14, 2018 by Gay Webster.